The two pieces that I decided to show are my mugs and a wooden relief carving. I wanted to show the mugs, because they did not turn out half bad and I love that I was able to make something useful. I has been wanting to throw on a wheel since I was really young, so being able to do that was really cool. As for the carving of the quail in the ponderosa pine tree, I love working with wood, and I love quails. I don’t have a strange obsession with them though. They just give me a really good feeling inside that reminds me of Arizona and my friends that live there. I think both projects showed my love for making things that make me feel good and show my love for God’s creation. In my opinion my most successful project this semester was my choice project #2 where I did a series of 3 mugs. They did not turn out as good as I had hoped but I like them anyways and they are useful. I enjoyed making them and I think that played a large role in why they turned out ok. I really hope to do more pottery in the future. If there was one project that I could change it would be my first choice project. I ended up making a leather card holder, but I hand stitched it, but I did not do a very good job at it. What I would change about it is that instead of doing the wallet I wish that I would have practiced with clay more and maybe my mugs would have turned out better. The media that I enjoyed the most this semester was ceramics. 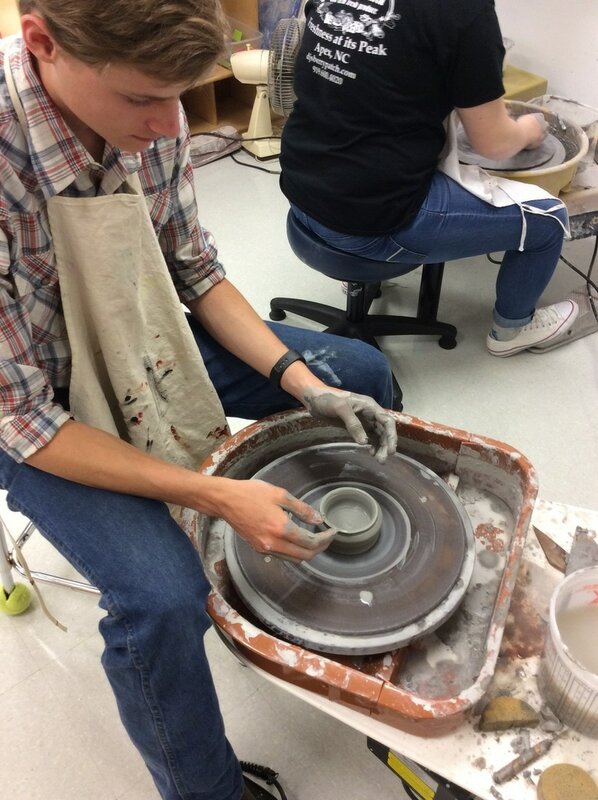 I really enjoyed throwing on the wheel especially. I think I like it so much, because since the wheel was invented it has been used for making useful tools out of earthenware or stoneware and I love making useful things especially when they are made out of natural material. For this project I decided to use a very inspirational quote that I remember seeing at some friend's house that own a ranch in Arizona. I has helped me to get through several circumstances. For the challenge I printed the quote and then tried doing an oil pastel drawing of a nice scene, but as one can tell, I am not very handy with drawing or painting of any kind. For the final challenge I- becaused of time not being on my side- decided to print out a picture of one of the owners of the ranch where I saw that quote and used it was my inspiration picture that goes along with the quote. I think it is quite fitting, because she is a very tough old lady. She deals with problems with such ease even though she is practically blind. Being in the occupation that she is in she has to able to resolve and deal with problems all the time, so she is a role model for me and that is why this quote means a lot to me. I decided to do a series of mugs for this project. I have 3 ceramic mugs, one with a handle and two without. I used a potters wheel to create them. several artists inspired my mugs, but I mostly was trying to make something useful and made from natural material. I hope to get better from from this, because I do want to make more bowls, plates and utensils. My goal was to make something useful and I think that I achieved that goal. This project has taught me a lot about ceramics, but mostly it taught me to have patience. ​For this project I decided to make something that would be useful to me and using materials that I like. I don't usually carry cash and so I only have cards of different sorts so I find card holders to be very convenient. I also love leather, anything leather, from boots, jackets, gloves, wallets, cases, saddles, chaps, ties, belts, etc. I Just like how it looks, feels, smells and I like the concept of using materials that occur naturally, unlike plastic and styrofoam. So even though the quality of this is very poor and if I were to do it again I would either use a sewing machine or leather string. 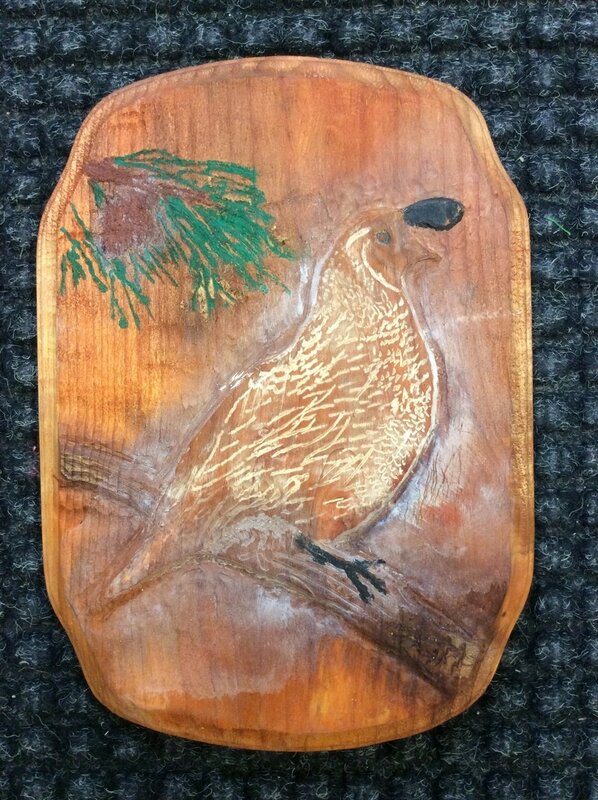 I choose to do a relief wood carving of a quail in a ponderosa pine. I used a dremel to do the carving and then used watered-down water color paint as a stain with some acrylic paint for the white feather accents and the pine tree needs and the cone. I chose to do a bird, because I thought that it would be something on the easy side to carve and yet cool looking. I really was having a hard time naming my "piece of art". I think I finally settled with: "The Dark Side of the Force". 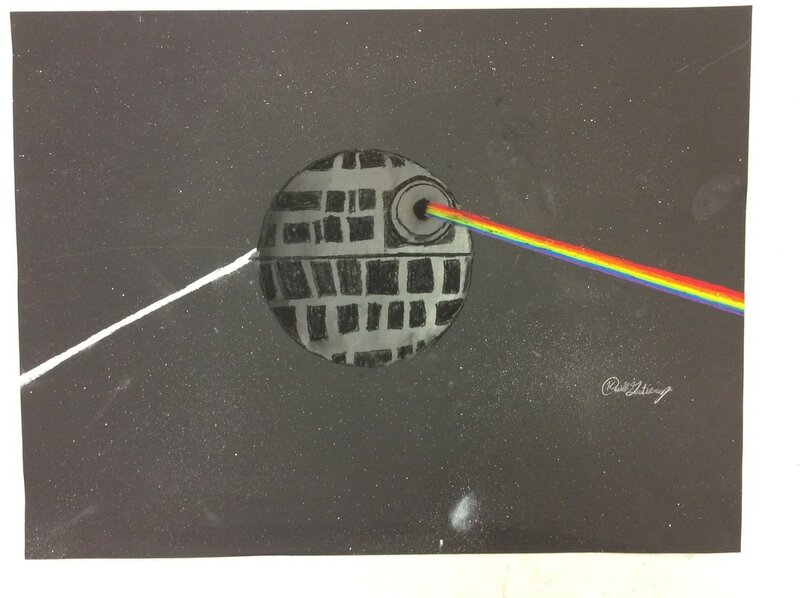 It might sound a little cliche or unoriginal, but it is not called that because the Death Star is in the picture. 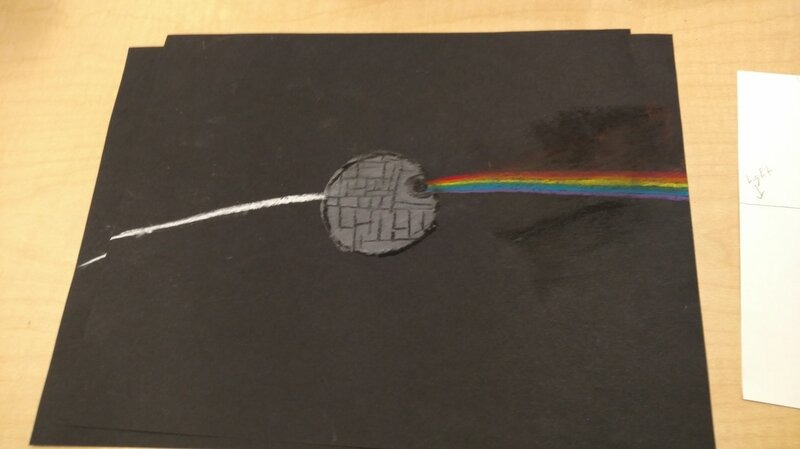 It is a merge between Pink Floyd's Dark side of the Moon album which was quite a dark, ominous and honest album. Some of there songs are quite chilling actually and that reminds me of the Death Star (the most destructive weapon ever invented) . I think that it draws so many similarities; the sobering songs of the DSOM album by Pink Floyd that speak of trivial things in life that we seem not to be able to live without and that we let rule our lives along with life's problems in this = world. They relate a lot with the stupidity and irony of the Death Star. The Death Star was built by people that wish to take over the galaxy so they build a contraption the size of a moon that destroys entire planets. So much for conquering land if you are destroying it. I can just picture the emperor and the engineers and the workers behind the building of Death Star along with the rebels listening to the songs, "Money", "Time", "Us and Them". 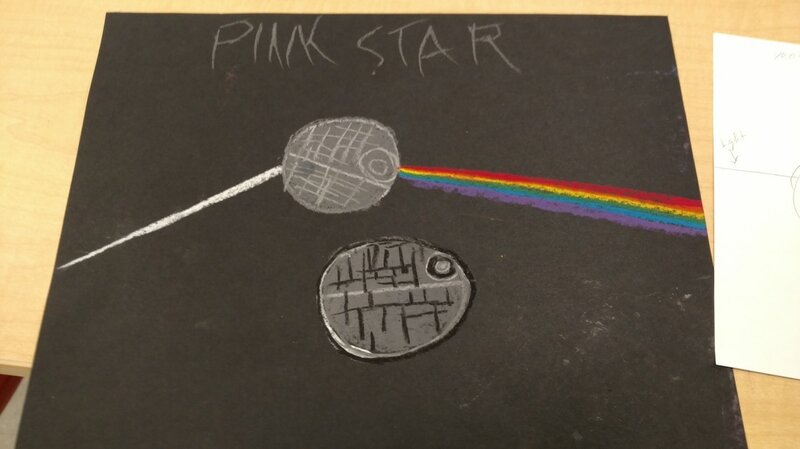 Personally I am a huge fan of the Star Wars saga and appreciate a lot the music of Pink Floyd, so I feel that this was a good choice for me to do. Thank you Mrs. Schumann for helping me on this to. Oh and by the way, I do not want anyone to think that the divided light's constituent colors are in any way directly or indirectly relating to the significance that the colors of the rainbow have nowadays. I am in no way, directly or indirectly affiliated with the support or practice of homosexual, bisexual, or transgender activity. Just in case anyone had any speculations or assumptions. Thank you. My piece is based on, both, my love for the southwest and for my love of natural beauty. 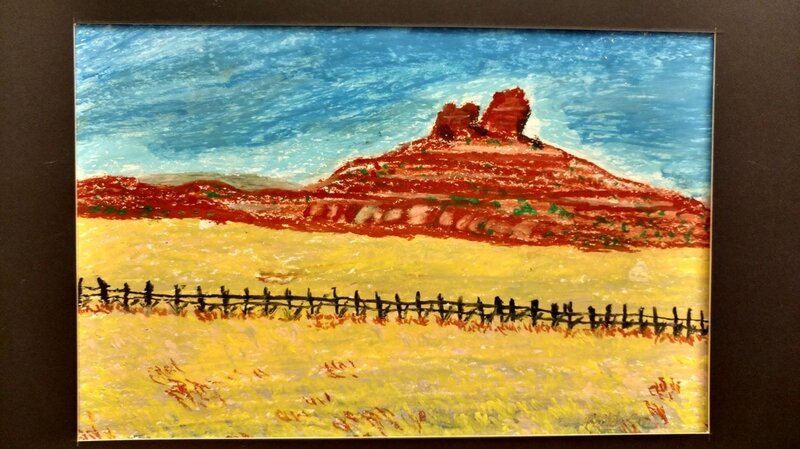 My intent was to make it look like the fields of Prescott with some rock formations of Sedona. Although it did not turn out as good as I was wanting it to. I really enjoy looking at landscapes like that so I wanted to combine 2 of my favorite views.I decided to use oil pastels for my piece, because I like oil paintings, so this was as close I can get to that I think. The landscapes inspired my artwork a lot, but also a very good friend of mine who is also in many ways my role-model and is also an artist: Rygh Westby. I did not reach my goal but I think that I did get better. One thing that I learned during the making of this piece is that depth is quite hard to achieve and that I need to take into consideration distances and shadows. I think that I will one day be trying to make a better version of this piece. I Love nature, but I'm not a hippie. I'm in the welding dept. I don't think of myself as a creative person.